A200012 S" Hook - joins individual wire shelving units end-to-end, back-to-back, or at right angles. Two S" hooks required for each shelf connection. A200868 Double threaded bolt for post extension. A203078 Joining clamps. Use these and two additional posts, to create various solid shelving add-on configurations. A203568 Casting - stabilizes leveling foot. A204318 Clip for solid shelf (only). Attaches enclosure panels to solid shelving. A207199 Chrome square foot plate. A208627 Stainless steel square foot plate. A208908 Aluminum split sleeves with stainless steel rings. Used for conductive purposes. Set of four. A208909 Aluminum split sleeves with zinc rings. Used for conductive purposes. Set of four. A214169 black, post clamp - provides maximum strength when shelving units are connected by clamping post together securely. A219236 Plastic conductive split sleeve. Packed four per bag. A226104 Black square foot plate. COLLAR PLUG Collar plugs fill shelf corner openings where posts have been eliminated. CRC Can rack for use on 24" wide shelves. Holds eight #10 cans. 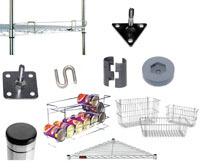 Rack is front loading, front dispensing, gravity feed, and is made of chrome-plated mild steel and heavy gauge wire. FOOT PLATE Chrome triangular foot plate. FOOT PLATE-BL Black triangular foot plate. FOOT PLATE-S Stainless steel triangular foot plate. GLIDES Protective glides fit under leveling foot to protect floors from abrasion. LEVELING FOOT Use leveling feet to accommodate uneven floors. PLASTIC SPLIT SLEEVES Plastic split sleeves are packed four to a bag. POST CAP Post caps fill post end openings at the top of the shelving units. POST CLAMP chrome, post clamp - provides maximum strength when shelving units are connected by clamping post together securely. PZD-Z 28" pizza box divider. 26" height. Attaches onto 14" wide shelving. Zinc finish. Sold individually. R54-C 54" chrome rod tabs, used to enclose backs or sides of shelving units to prevent contents from falling. Also used to partition shelving units by positioning rods interior to shelves. Each rod comes with four tabs. R54-S 54" stainless steel rod tabs, used to enclose backs or sides of shelving units to prevent contents from falling. Also used to partition shelving units by positioning rods interior to shelves. Each rod comes with four tabs. R63-C 63" chrome rod tabs, used to enclose backs or sides of shelving units to prevent contents from falling. Also used to partition shelving units by positioning rods interior to shelves. Each rod comes with four tabs. R63-S 63" stainless steel rod tabs, used to enclose backs or sides of shelving units to prevent contents from falling. Also used to partition shelving units by positioning rods interior to shelves. Each rod comes with four tabs. R74-C 74" chrome rod tabs, used to enclose backs or sides of shelving units to prevent contents from falling. Also used to partition shelving units by positioning rods interior to shelves. Each rod comes with four tabs. R74-S 74" stainless steel rod tabs, used to enclose backs or sides of shelving units to prevent contents from falling. Also used to partition shelving units by positioning rods interior to shelves. Each rod comes with four tabs. R86-C 86" chrome rod tabs, used to enclose backs or sides of shelving units to prevent contents from falling. Also used to partition shelving units by positioning rods interior to shelves. Each rod comes with four tabs. R86-S 86" stainless steel rod tabs, used to enclose backs or sides of shelving units to prevent contents from falling. Also used to partition shelving units by positioning rods interior to shelves. Each rod comes with four tabs. RETAINING CLAMP Retaining clamp attaches enclosure panels to wire shelving. S-HOOKS-SK security "s" hook, discourages separation of adjoined shelf units. Hardware included. SLS1836C 18" x 36" sliding wire shelf for shelving units. SSENCBKT Set of 4 clips for bottom solid shelves (only). Attaches enclosure panels to solid shelving. TR18BL 18" wide, black wire triangle shelf. For use with standard shelving posts. TR18C 18" wide, chrome wire triangle shelf. For use with standard shelving posts.